Find out the amazing stories behind the world’s most famous paintings and the artists who created them in this beautifully illustrated sticker book. 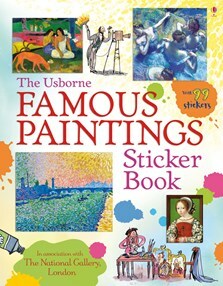 Includes 99 stickers of stunning artwork to add to the pages, accompanied by fascinating information about the artists, their techniques, inspiration and their lives. A fun and interactive way for all ages to learn about some of the greatest paintings in the world, and with internet links to study more paintings online. Produced in association with The National Gallery, London.